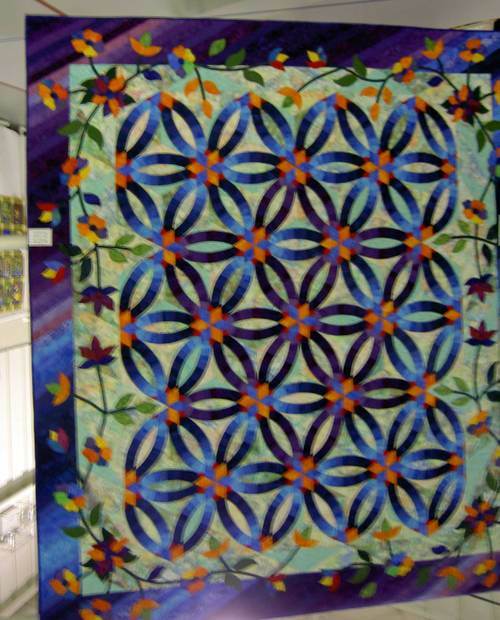 I went to the Oakland County Quilt Guild Spring Show yesterday after work. 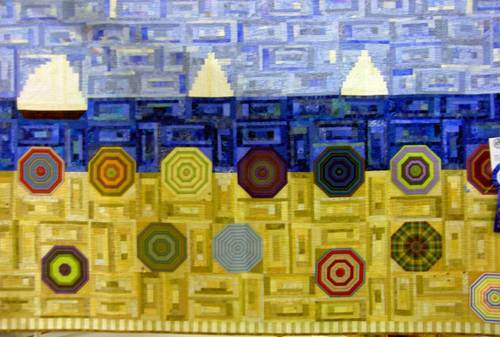 Seeing all the quilts was like perusing the flickr quilting gallery, but in 3-d instead...so inspiring! Unfortunately the lighting in the display room was horrible and I only had my little point and shoot camera with me, so the photos I did take were not so good. Hopefully you'll be able to see past the blur and wonky colors to see some inspiration yourself! This was just part of a huge king sized quilt. These triangles are actually about 6" long on each side. 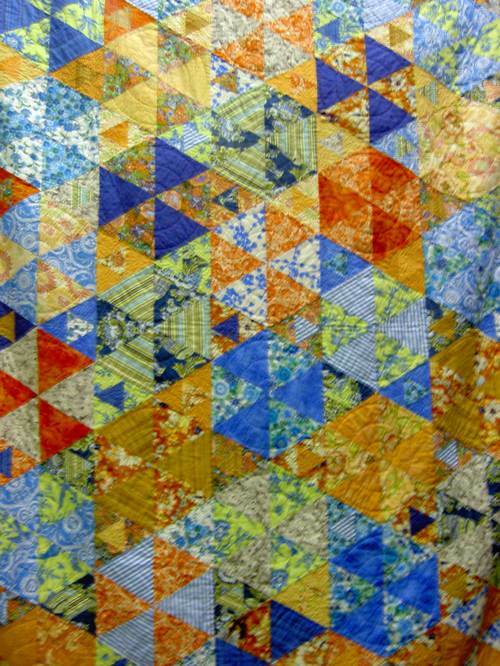 Great inspiration for a scrappy quilt! 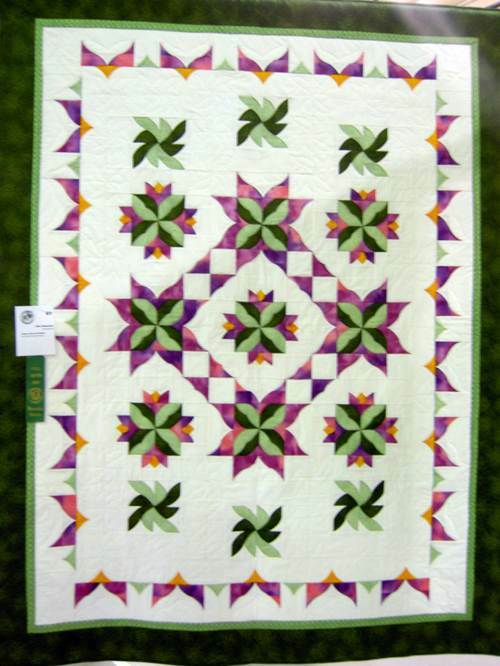 This reminded me a lot of the Dear Jane quilt blocks but in an updated version. 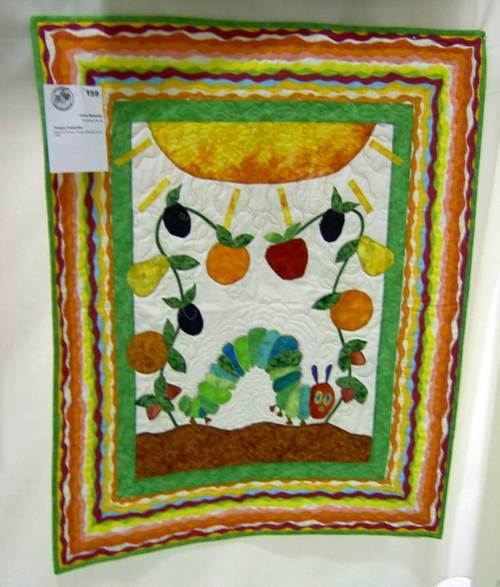 This must have taken the quilter forever! 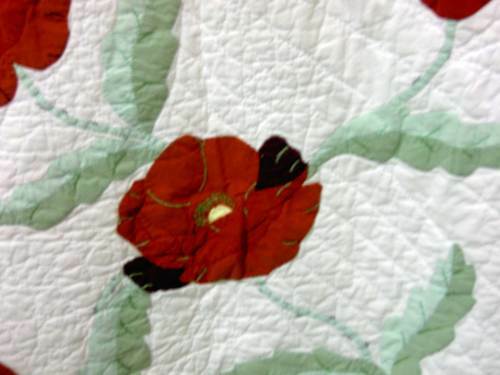 Part of a large vintage Christmas quilt from the 40's. I really love the look of the watercolor, Georgia O'Keefe style flowers. The centers of the flowers used french knots for a beaded look. 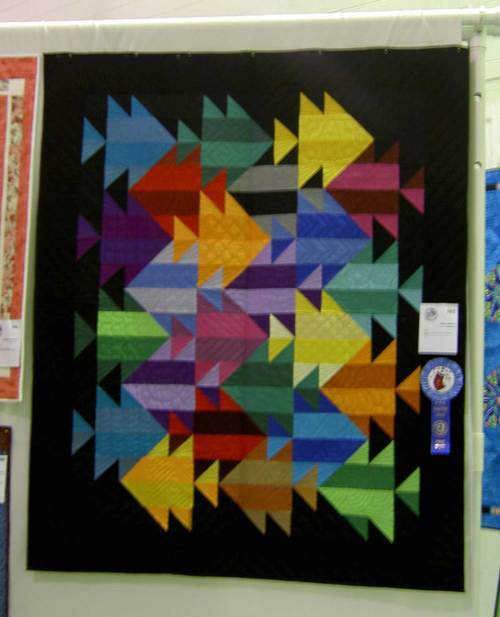 Loved the color combo on this quilt. This picture definitely does not do this quilt justice. A king-sized diamond double wedding ring quilt. Stunning in person! Loved the bold, bright colors. 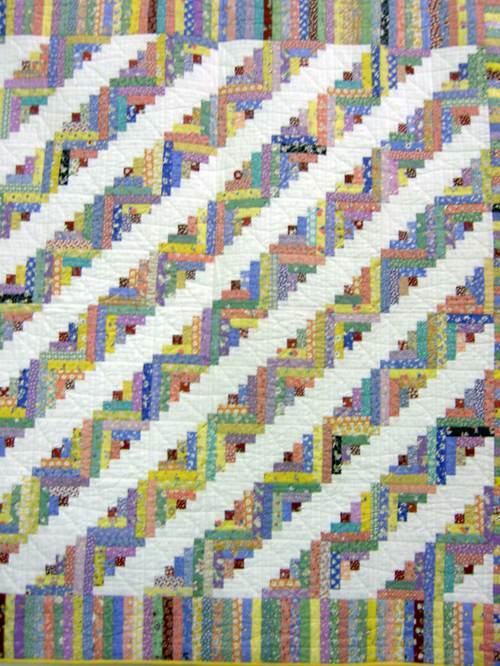 A log cabin quilt made with Aunt Grace repro fabrics. Love the classic vintage look of this. A fish quilt with bright colors. 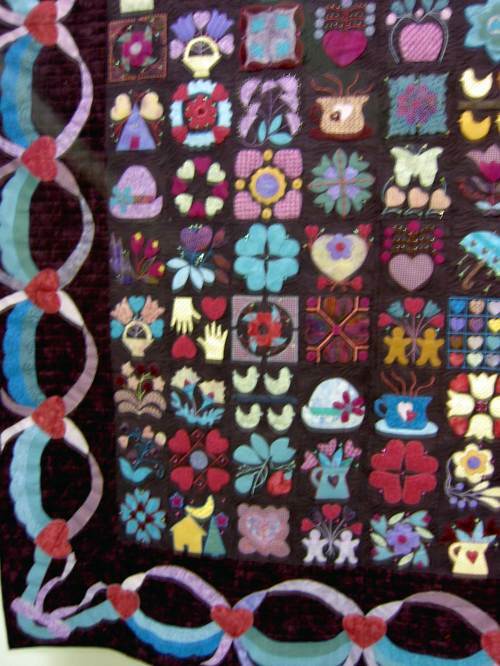 Each of the fish had different quilting designs to give them unique scales. 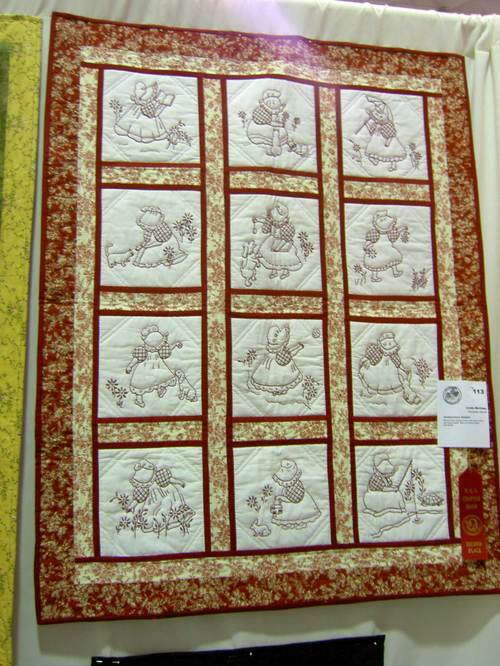 My favorite quilt of the show...love this log cabin beach scene. Aren't those umbrellas adorable? the kitties want more screen time here! I shot these photos last weekend when I caught Shinji and Jon catching up on some bonding time. Shinji has a major crush on Jon and often looks up lovingly into his eyes as they share a special moment together (much to my dismay). Shinji has always been jealous of me because I took Jon away from him. In fact, just after we got married, I woke up to find Shinji sprawled out between us, pushing us toward opposite ends of the bed. Jealous much?! Shinji still sleeps between us, but he has finally started to warm up to me. One out of ten times he will even choose me over Jon. Success! Lately, Shinji and Nuku Nuku have become very enamored with the world of blogging and emailing. They're always trying to help us out by pushing the space bar to scroll to the bottom of the page while we're reading and by highlighting text whenever we need to do a quick copy/paste. And they're especially good at helping us type posts and emails. They're spelling isn't so good, so they often type words that contain only one letter continuously, but we're holding out hope for improvement in this area! And, horror of horrors, Nuku Nuku has figured out how to press the "num lock" key on my keyboard with her paw. The first time she did it, I was majorly panicked because I thought my computer had died, but luckily, I figured out what she had done just before I went to call the Apple helpline. I'm glad I didn't embarrass my self with that question: "Only the 9 center keys are working, and they are just typing out numbers. What should I do?" I'm a smart one, you know! My sister saw this pillow and requested that I make her one. I love having a functional way to display embroidery that doesn't show the messy back side. The pattern is the Kurt Halsey Artist series from Sublime Stitching. I finished the pillow off with a patterned fabric border and backing. This fabric is from a Kaffe Fasset line, but I'm not sure of the exact pattern name. I don't think I'll ever tire of making these cable knit purses. They're such a classic pattern and I really love using the Lamb's Pride yarn. I have to hold myself back from buying more of this yarn in different colors whenever I'm at a yarn shop! Jon and I worked on a little DIY project this weekend and were quite pleased with the results. Heck, if we knew it would be so easy to recover these chairs, we would have done it sooner! We inherited this kitchen table and set of four chairs a few years ago and had intentions of sprucing it up with new fabric but never got around to it. I recycled some fabric from the curtains in my bedroom from my single days. This was actually my first sewing project that I completed without any assistance from my mom. I used home dec fabric, a white lining and then put grommets in the top and used a green grosgrain ribbon for the tabs. Well, I've kept the curtains for the past two years with intentions of somehow reusing it. I finally cut up the fabric on Saturday and lined it with cotton interfacing to make it sturdier (it's a woven multicolored green striped fabric that's not very rigid). Then Jon and I removed the old fabric covering the chairs and replaced it with this green fabric. All in all, it took us about one hour to recover four chairs. There are directions here if you're interested in trying it out. I'm definitely going to be making more of these. It was so simple and quick to knit up! We'll see if we can curb our paper towel habit with these things! And, in the garden excitement category...I spotted one tulip bulb beginning to pop up on Thursday afternoon, but I had to wait until yesterday to get a photo. After all, the 4 inches of snow that fell on Friday had to melt first. Jon and I celebrated our 2nd wedding anniversary this weekend with a trip to a bed and breakfast in Guelph, Ontario. 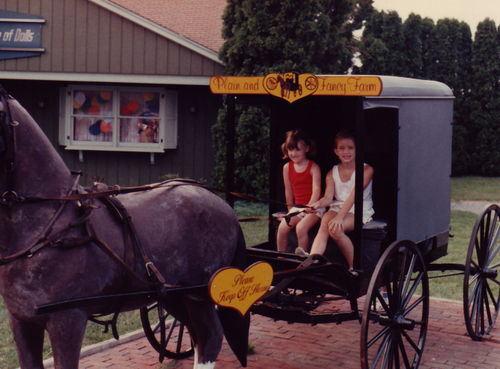 The B&B was such in a beautiful old brick house in downtown Guelph. The breakfasts were delicious and we enjoyed relaxing in our red room. Our host at the B&B gave us lots of great suggestions for restaurants and touristy things to do, so we were able to take in some local culture and expand our waistlines with delicious food. Then, on Sunday afternoon, we took a short driving tour of Guelph (it was cold! ), and stopped off at the beautiful Catholic church perched on the hill overlooking the city. After, we headed to Elora, ON, which is a quaint little town known for its Gorge. We window shopped and then ended up eating at the Old Mill Inn, an inn and hotel situated right on the Gorge. We sat on the outdoor covered/windowed balcony and enjoyed our lunch while taking in the amazing view. I attempted making this bag last fall and failed miserably (I blame the crappy fabric I used)! This time was a great crafting feat. I finished it in two hours and with little frustration...truly a rewarding afternoon project. And, if I ever make this pattern again, I will definitely remember to add a magnetic snap closure! Something I still don't understand: I had the hardest time doing the final top stitch because the part where the pleats are folded in together has about 12 layers of fabric (three layers from the front pleat and three layers from the back pleat sewn together to attach the outside and lining and then and folded over for the top stitching to create 12 layers)...how is this supposed to lay flat? I have examined lots of bags in the flickr pool, and none look as bulky as mine. What did I do wrong? weeHomes - We'd love to build one of these some day on a nice patch of property in the woods with enough sunny space for a large vegetable garden. We can dream, right?! My best NPR find since The Album Leaf: Bon Iver, currently playing at SXSW in Austin. Can't wait until he comes to Detroit! I just pulled this quilt out of the dryer...so satisfying to finish such a long term project (total lapsed time: 9 months!). I'm so glad I decided to pick this up and finish it last weekend. It feels good to cross another thing off the list! Remember this quilt from last summer? Yeah, the one I had intended on using instead of our down comforter during the summer. Well, the good news is that I'm hoping to have it finished by this summer instead. I pulled it out of hibernation last weekend and assessed the damage. I had to pull out all of my basting pins (sad!) and rip out the little quilting that I did do. I washed the top to get rid of the lines and re-drew parallel vertical lines (as seen here), re-basted it and have been quilting a few lines here and there in the evenings. I will definitely be glad to have this project out of the way! And, here's a set of bibs that I made for Oiyi's daughter, Melody, who was born back in January. I used the now famous bib pattern from Chick Pea Sewing Studio, some japanese character prints that I bought in Japan last year, and the side view of the pig from the Christmas ornament freebie at weewonderfuls (my attempt at hand sewing a stuffed golden pig was quite laughable, so I went with the two dimensional version instead!). 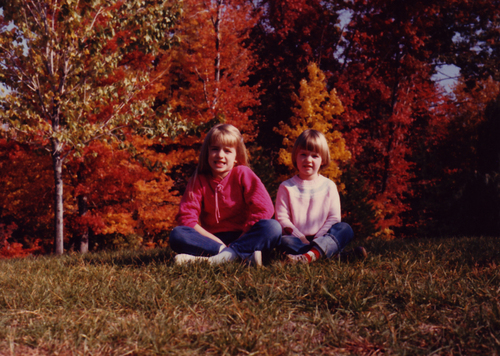 Happy birthday to my little (but taller) sister, Ruth! Thanks for being a coerced willing participant in my crazy schemes (playing dentist with a set of nut pickers seemed like a good idea at the time). 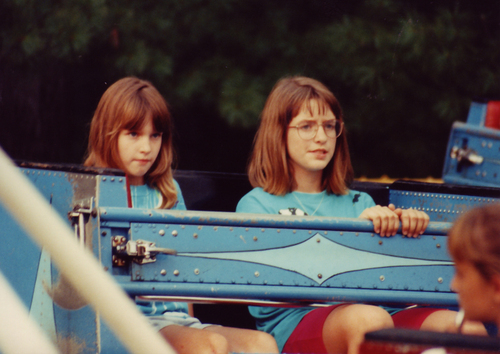 I'm sorry that you've had to put up with a bossy older sister like me for the past 24 years! Jon and I have been on a bit of a used book buying binge lately. First it started with paperbackswap.com where I've been trading my unused books for new to me books. Then we discovered the little library used book store, which has great prices (nothing over $1). And then Jon finally introduced me to John King Used & Rare Books in Detroit. Why had I never checked this place out before? I don't know. We headed down to the city yesterday afternoon and spent a few hours browsing all four floors of books. It's the mecca of used books on any and every subject you can imagine and is the largest used bookstore in the country. The store was overwhelming at first and I was kicking myself for not bringing along my book wish list, but I ended up finding a few things to purchase - two novels and a great book on the history of NPR (my daily necessity!). It's so inspiring being surrounded by shelves and shelves of books! There's so much out there to read and learn about! We ended our Saturday afternoon book tour at a local used bookstore: Royal Oak Books. It was a bit pricier than the library book store and John King, but they had a good selection and we both found a couple of books to buy. Plus, the store was "run" by these two cute calico cats that followed us around the store while we were browsing. A bookstore with cats...great combo in our eyes! And speaking of books...I was accepted into grad school for Library and Information Science and I start my first class in May. I hope to complete my master's degree in two years and am so excited to head back to school and to see where this new field of study takes me.